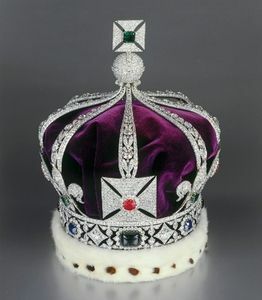 The imperial crown of the Indies, called Imperial crown of India in English, was made for George V when India became a member of the British Empire. 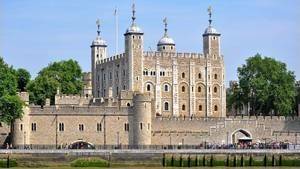 It is part of the Jewels of the crown and is kept in the jewel room in the Waterloo barracks of the Tower of London. This crown is the most recent, it dates from 1911. It is the counterpart of the imperial imperial crown, the main crown of the British monarchy, and the crown of St Edward, the "historic" crown. If these last two are always worn (on rare occasions, that is to say only at the time of the coronations), the imperial crown of the Indies was only once in history. Like the other British crowns, the Imperial crown of India consists of a circle surmounted by four crossed patés and four fleurs-de-lis. 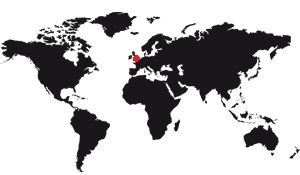 However, the arcs at the top, which meet in a typical world and cross, point upward in an Asian way instead of bending down like the other British crowns. It is also the only British crown with eight half arches, following the style of the continental European crowns, according to the British tradition of crowns with four half arches. This difference is emblematic of the distinction between the crown of an emperor or the empress and that of a king or queen. Above all, it is necessary to know that the jewels of the crown can not leave the British territory, it is a tradition destined to ensure their presences in the country. Thus, when George V became Emperor of India, it was necessary to make a new crown which he wore only once, at the coronation ceremony held in Durbar in 1911. This ceremony officially King George and Queen Mary as Emperor and Empress of India, and this vis-a-vis the princes of India. In practice the "official" coronation never took place because, according to Archbishop of Canterbury Randall Davidson, being crowned Emperor and Empress of the United Kingdom was sufficient for the being of the Indies. And as it seemed unthinkable to do a Christian ceremony in a country with a Hindu and Muslim majority, the ceremony in Durbar was to announce that the coronation was made in London some time before. This crown was manufactured by the jeweler Garrard & Co.. From an initial price of £ 60,000, it is now estimated at £ 5,300,000. It weighs just under 1 kg and contains numerous rubies, emeralds and sapphires. It also has 6100 diamonds and a large oval ruby. The weight of the crown wounded King George at the front. Of all its recent history, this crown has been worn only once.